Take a leaf out of Munro Leaf's books. Take a leaf out of Munro Leaf’s books. I’ve long had a saying that the ‘yous’ belong in the back paddock and it seems I have a kindred spirit in Munro Leaf. American author Munro Leaf wrote nearly 40 books during his career and is probably best known for his children’s book, The Story of Ferdinand. The story caused international controversy when it was published in 1936, with Ferdinand the bull labelled a pacifist symbol and banned in some countries. Nevertheless, the book has never been out of print and is still a well loved tale to this day. Whilst the name Munro Leaf may be familiar thanks to Ferdinand, few people are aware that Leaf was very big on manners, good behaviour and how to speak properly. During the 1930s and 1940s, Leaf wrote a number of books for children about etiquette. Not surprisingly, these books are as relevant today as they were 70 years ago – although standards may have altered a little, we still expect our children to show honesty and fairness and to speak politely. 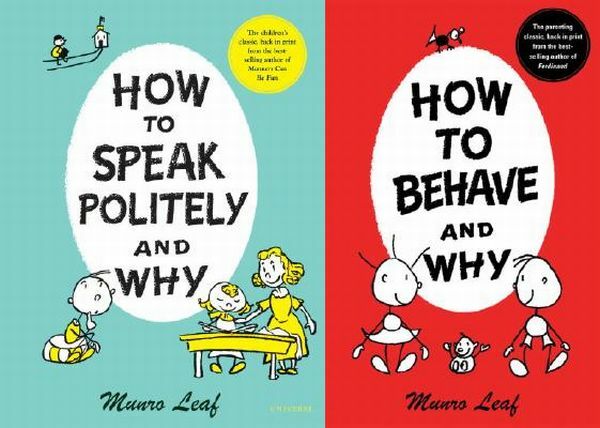 In writing Manners Can be Fun, How to Speak Politely and Why and How to Behave and Why, Leaf has created dozens of characters that appeal to children and adults. 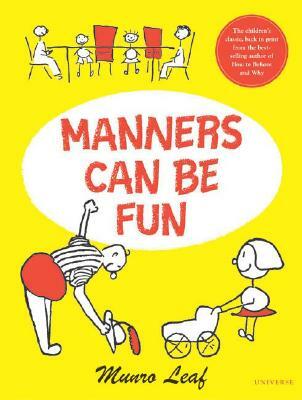 With such characters as the Mefirsts and the Whineys, children can laugh while learning the basic rules of thoughtfulness. There’s also Gimme, a demanding spider-like creature who would be much nicer if he said “Please give me…” rather than shouting “Gimme!” all day and Gimme’s two, not-so-charming little sisters, Gonna and Wanna. Apart from being a thorough and basic introduction to grammar, the illustrations are simple and fun and the ‘story’ is really very funny. I think How to Behave and Why could be the solution to lots of playground politics. In a clear and simple way, Leaf explains why it is important to be ‘Honest, fair, strong and wise’. These may sound fairly lofty ideals but Leaf examines each in a way that is relevant to children and breaks it down into topics such as telling the truth, the problem with cheating, sharing and being friendly – “Nothing we get by cheating is worth what we lose with our friends” and “Anywhere you go with a smile and a wish to like people, you will find someone who will be glad to see you.” Simple sentiments written in the 1930s that still hold true today. Leaf books are available through Fishpond at $22.95 each. One more title in the series is Brushing Your Teeth Can Be Fun.